Please type your desired tags, e.g. Latin America, Art & Science, Information Theory, Mechanical Engineering, Transcriptional Regulation, Communication Theory, Health Careers Preparation, Experiential Education, Social Change, Conflict Management, Leadership, Culture, Trope of monstrosity in literature and film, LGBTQ literature, Holocaust Studies, and etc. 2018–2018	1997 Scott A. Rippel and Ernest M. Hannig. Functional analysis of mutations in the g subunit of yeast eIF-2 that alter selection of the translational start site. Poster, Southwestern and Rocky Mountain Division, American Association for the Advancement of Science, Annual Meeting. 2018–2018	1996 Scott A. Rippel and Ernest M. Hannig. Functional analysis of mutations in the g subunit of yeast eIF-2 that alter selection of the translational start site. Poster, UTD Biology Graduate Student Symposium. 2018–2018	1997 Scott A. Rippel and Ernest M. Hannig. Functional analysis of mutations in the g subunit of yeast eIF-2 that alter selection of the translational start site. Poster, San Francisco Translation and Stability of mRNA Symposium. 2018–2018	1998 Scott A Rippel and Ernest M. Hannig. Analysis of the N-terminal domain of yeast eIF-2. Oral Presentation, UTD Biology Graduate Student Symposium. 2018–2018	1997 Scott A. Rippel and Ernest M. Hannig. Functional analysis of mutations in the g subunit of yeast eIF-2 that alter selection of the translational start site. Oral Presentation, UTD Biology Graduate Student Symposium. Dr. Scott Rippel MS'96, PhD'99 has a honey of a deal for students at The University of Texas at Dallas. This fall, the senior lecturer is teaching Honey Bee Biology, a survey course where biology undergraduates learn about the insect’s biology, behavior, social organization and role in the environment and agriculture. 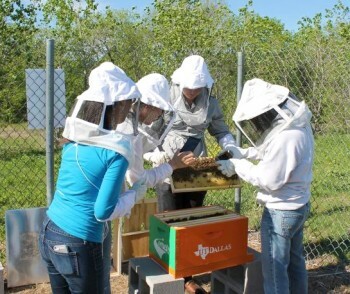 Students in his class get hands-on experience with basic beekeeping in the campus apiary, including maintaining the colonies and harvesting honey. Rippel, a decorated U.S. Army veteran, had no formal experience as a beekeeper before teaching the course. He earned both his MS and PhD in molecular and cell biology from the Department of Biological Sciences in the School of Natural Sciences and Mathematics and has been teaching since 1999. For the third consecutive year, UT Dallas has earned recognition as one of the most environmentally responsible colleges in the U.S. and Canada in The Princeton Review's Guide to 332 Green Colleges. UT Dallas, one of seven universities in Texas to make this year’s list, was commended for establishing an Office of Sustainability, which seeks to “mitigate UT Dallas’ footprint on the environment, to raise visibility and awareness of environmental issues on campus and our community, and to engage UT Dallas students, faculty and staff in developing sustainable policies and practices.” The office works with other departments on campus to organize environmentally focused events, such as this week’s Earth Week, and supports organizations such as the Community Garden and Green People, a new student organization.